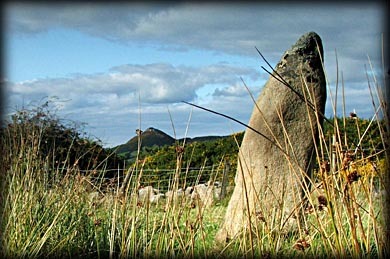 The Longstone at Ballard is situated in a beautiful unspoilt area of South Armagh. 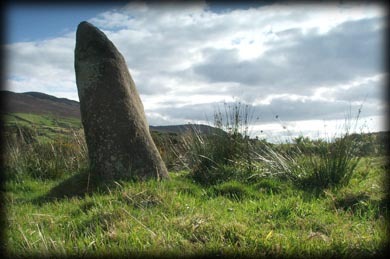 The stone is quite small for a megalith bearing the name longstone standing at almost 1 1/2 metres high, but having said that it is quite an attractive shape. In the background below you can see Sugarloaf hill, this really is a beautiful area as the views from the stone show. I really enjoyed my stop here and will definitely call back. Situated: In the townland of Ballard, County Armagh. From Newry take the A25 west and then the B30 South West then take the third left after crossing Camlough. After approx 1 kilometre the road starts to rise and there is an entrance to your left the stone can be seen about 100 metres to your left. Discovery Map 29: J 0155 2343. Last visit Sept 2005.